I’ve been watching the various initiatives the Australian National Innovation & Science Agenda (NISA) have started and see that they recently launched some more initiatives including the funding of incubators http://www.innovation.gov.au/page/incubator-support-programme. There is regular talk about start-up incubators and accelerators, as well as hubs and more, this got me thinking about what it would take for incubator success, and this is a Mind Map with my thinking so far. Seems to me that it is much more than just space and funding, and that the environment, networking, mentoring, collaboration and collision, as well as useful creative thinking methods are all part of what would create a truly successful incubator. 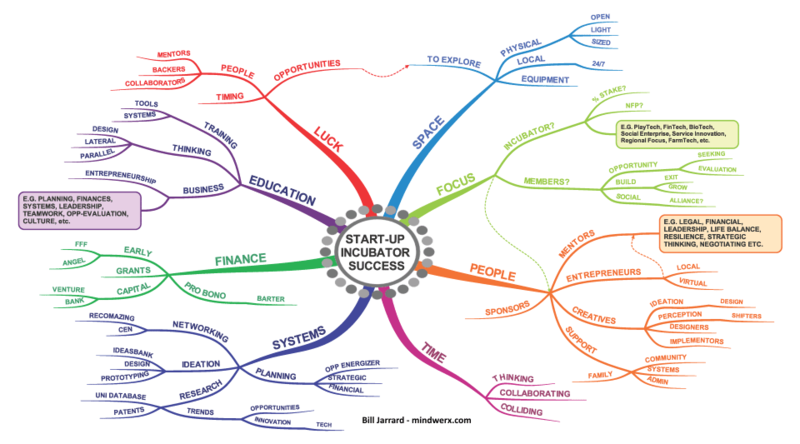 Mind Maps as developed by Tony Buzan are now used by millions of people globally, and this is another good example. At Mindwerx we love Mind Mapping, and have free eCourses, Online programs and in-house workshops we can deliver for your organisation. Check out our Advanced Learning Skills programs, which occasionally run as public programs. Bill Jarrard, co-founder of Mindwerx International also facilitates a range of critical and creative thinking programs, including several workshop looking at Edward de Bono’s Six Thinking Hat®, Lateral Thinking, and DATT. He also facilitates strategic thinking workshops with executive team, innovation scums, and our benchmark 90-Day Innovation Challenge. If you like to know more about the range of Mindwerx creative thinking and advanced learning programs, including how to Mind Map of course, just email the team@mindwerx.com.